Start with Turkmenistan Travel Facts. Turkmenistan is not an easy country to get into, so it's understandable that you're tempted to visit. Turkmenistan is one of the largest countries in central Asia, but the barren Karakum Desert dominates a vast majority of its area. Travelers have to be determined and persistent and almost always part of a certified tour group to see the country. If you do choose to visit the country, Turkmenistan has several sights worth a visit. 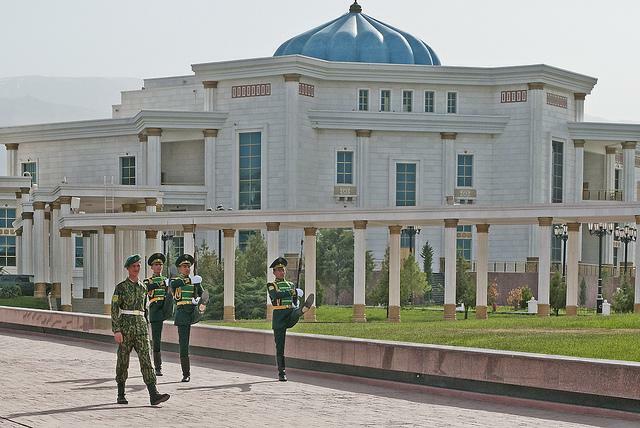 Ashgabat is Turkmenistan's capital city and almost every trip's starting point. Travelers often start their trip here because it is one of the only international airports at which to land, and also because the Parthian settlement of Nisa, a world heritage sight, is located nearby. Also tempting in Ashgabat, out of sheer morbid curiosity, is the statue of former Turkmenistan leader Saparmurat Niyazov in Ashgabat. Niyazov took totalitarianism to a new level during his two decades of rule that ended in 2006. In addition to renaming a city and the month of January to his name, he changed the days of the week and the word for bread so that it was named for his mother. Travel into Turkmistan is limited to flights from a few select European cities to the capital of Ashgabat. Flights arrive from London, Birmingham, Frankfurt and Istanbul and require a visa that must be procured in Ashgabat. There is also a train connection from Russia and a ferry between Baku in Azerbaijan and the coastal city of Turkmenbashi a few times a week. Once inside Turkmenistan, flights are extraordinarily cheap around the country, often $10 or less. Hotels throughout Turkmenistan are available to travelers and their tour groups. Accommodations are modern and achieve a basic level of comfort but are not luxurious. Most are part of a package deal with a tour group and options may be limited.